Consumers in the market for a new hot tub are often overwhelmed with choices, making the shopping experience stressful and frustrating. But, knowing what to look for is an easy way to ensure you invest in a tub to fit your needs. 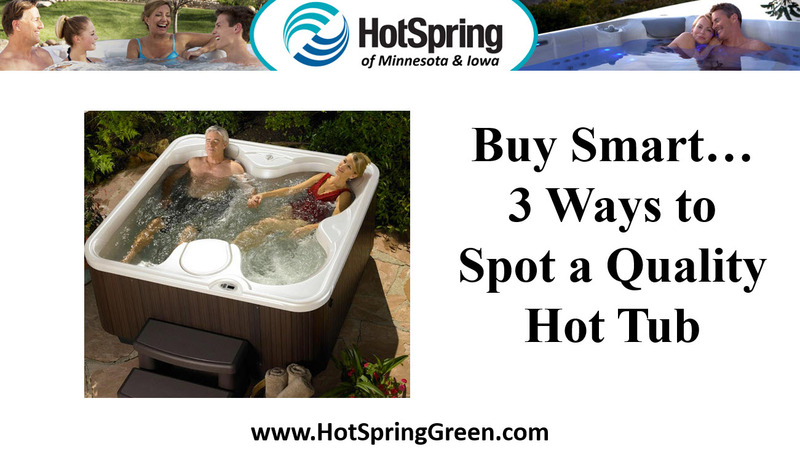 Here’s what to look for – and how to easily spot a quality hot tub in a sea of choices. Comfort, Comfort, Comfort – Buying a hot tub to relax? Don’t be afraid to try out the tub—and the seats—to find the perfect combination of comfort and convenience. Think about scheduling a private soak to get a feel for the hot tub you like when it’s filled with water. Money Saving Components – The best spas are innovative, especially when it comes to saving energy. With heaters, lighting and jets designed to be low cost, it’s easy to find a lavish spa that’s practical too. Look for multiple layers of foam for efficient insulation, a quality spa cover and cost saving components. A Full Warranty – Reputable hot tub dealers offer a warranty on their product, but no two are alike. Total warranty protection, offer coverage for defects to your shell and cabinetry, plumbing and other components for many years, making your hot tub able to stand the test of time. To learn more about the benefits of owning a hot tub, pick up a copy of our free hot tub buyer’s guide, 7 Critical Questions You Must Ask Before You Buy a Hot Tub. GO to Our Website https://hotspringgreen.com/all-guides/ orJust give us a call at ☎ 651-731-9745.